Monday 25th July was an exciting day for Bute Produce, after 3 years of careful nurturing the first crop of Bute Heritage Potatoes was forked from the earth. We were gifted just 5 tubers of 3 heritage varieties from SASA – Beauty of Bute (1912), Pride of Bute (1892) and Marquis of Bute (1914). Learning the art of cultivating, over-winter storing seed, and increasing the crop year on year has been challenging and rewarding for Ronnie and Rab. Unfortunately the Marquis of Bute didn’t make it through last winter, perhaps different climes were needed. However, it was fantastic to announce to our community that a successful crop of Beauty and Pride meant we could put them on public sale for the first time! And they have been flying out The Veg Shack. Bute Produce are also growing three main stream varieties and these will be available through the rest of the year – Charlotte, Maris Piper and another local variety Arran Pilot. But there is more to the tattie story than you might think. 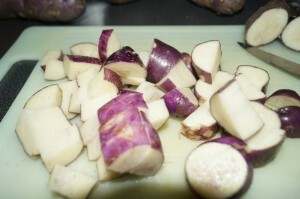 Mass production of potatoes has some significant environmental impacts. Depending on where the crop is grown there can be high use of water, with eutrophication impacts for natural water courses. Of course, after harvest our modern supply chain requires potatoes to be packaged and large quantities are processed to make it more convenient and attractive for us to buy. This processing results in high energy requirement, and whilst refrigerated storage is not as high as some foods there is still some significant impact as a result of the supply chain. Commercial potato growing requires a lot of land and a massive amount of pesticide use. With commercial organic potatoes land use increases but pesticide use is lower, so that is an improvement. 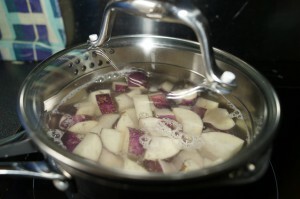 Of course, if our potatoes are turned into convenient snacks energy and water use will be greatly increased. The commercial tattie goes on quite a journey from field to plate and each bit demands energy – cultivation > transport to packing company > packaging company and packaging system (includes waste management) > distribution to retailer > retailer (includes waste management) > transport to home > householder use (includes waste management). 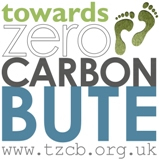 Buying a 5kg bag of potatoes from your local supermarket has 20.3 GHG Emissions (kg CO2e). If you grow your own or buy from a locally grown source, you can reduce that to just 2.7 (kg CO2e). If you stick them in the cupboard and don’t use them, then chuck them in the bin, you have just added another 3.6 kg CO2e but you can reduce that to 0.03 kg CO2e by putting them to compost. Of course, much better to ensure they are not wasted and with so many tasty ways to use your tatties why would you? So the cost of a 5kg bag of tatties is much more than £2.00 we pay. What can you do today? Tatties are really easy to grow and you can grow them in containers to suit your space. Or check out where you nearest local growers are and buy direct. When you buy use them all, once cooked potatoes will freeze well. And should you need to dispose of any, compost. 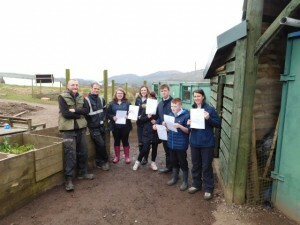 Bute Produce can help you make small changes with Grow Your Own workshops; provide growing space with access to a raised be; and give advice on composting.